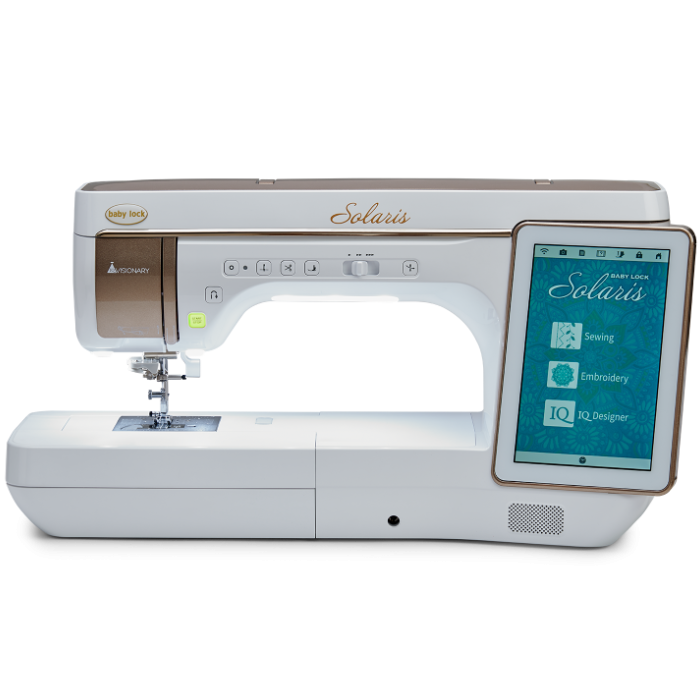 Introducing Solaris: Baby Lock’s new, top of the line sewing and embroidery machine. 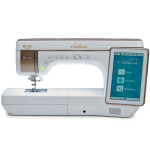 It features new IQ Visionary™ projector technology: Solaris’ built-in projector that displays your stitches, embroidery patterns, designs and even machine controls directly on your fabric in vibrant full color for perfect placement every time. You will be able to see all your creations before you sew even one stitch! Put your projects in an entirely new light with the Baby Lock Solaris. While in embroidery mode, choose from three different projection backgrounds based on fabric choices to see your design clearly. The needle drop laser is displayed in a “T” pattern for an even more precise placement. This multipurpose spool stand conveniently sits in the top cover. It’s perfect for use with twin needles for decorative stitches. For embroidery projects, set up both threads at the same time and quickly change from color to color. It also holds and support larger cones for your quilting projects..